Beautifully decorated wooden carved cart left the Colombo Sammaankodu Sri Kathirvelaayuthaswamy temple in Sea Street left in the morning and reached the Sammaankodu Sri Maanikka Vinayagar temple at night. The colourful procession paraded through the main streets in Colombo. Traditional musicians playing the Thavil and Naathaswaram led the procession. The festival wended through many main streets in Colombo after a lapse of 16 years. 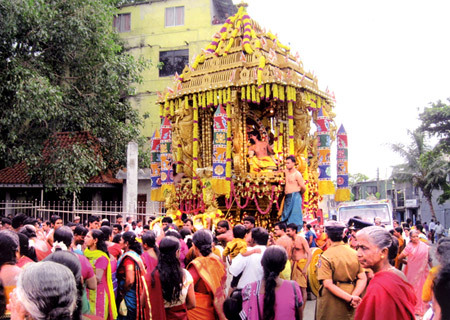 The colourful procession started from Pettah and travel through York Street, Echelon Square and Galle Road to Bambalapity, which has been the route for the annual Vel festival for more the 100 years.